Coming home to a clean house has many advantages. It cultivates a feeling of intimacy for your family, helps you relax, and creates a peaceful atmosphere. Unfortunately, your busy life has made it nearly impossible for you to maintain your household the way you'd like to. That's where Sears Maid Services comes in. Our highly trained cleaning professionals can clean your home at a time that is convenient for you. Whether you need regular cleanings or seasonal deep cleaning, our professionals are ready to tackle any cleaning job you require, including those hard-to-reach and unpleasant ones. Give us a call at (972) 439-8394. It seems as if housekeeping is never done. With your hectic schedule, doing your household chores can be a bit overwhelming at times. Sears Housekeeping Services can be just what you need to help you keep your daily stress at a minimum. Our skilled cleaning professionals will work with your needs and your schedule to keep your home sparkling. For those times that require a more exhaustive cleaning, our comprehensive Deep Cleaning Services can help get your home ready for a gathering or holiday celebration. Discover how Sears Maid Services' extensive Housekeeping Services can give your home the kind of clean you deserve. The condition of your offices and sales floor tells your clients and employees what they can expect from you. Clean, well-organized spaces say, "We have the skills and the discipline to thoroughly meet your expectations." To make your business as successful as it can be, your focus should be on business issues, not on emptying the wastebaskets. That's where Sears Maid Services' Commercial Cleaning Services can help. Our experienced janitorial staff will give your commercial spaces the attention they need, so you can give your customers the attention that they deserve. Experience firsthand the positive impact that Sears Commercial Cleaning Services can have on your bottom line. The mess left behind after construction can present a unique challenge. Superfine dust from concrete and drywall are difficult to get rid of, and can damage electronic equipment. Sears Maid Services is a professional cleaning service that is knowledgeable in post construction cleaning techniques. Our Post-construction Cleaning Service crews are trained to quickly and efficiently remove the dust and debris typically left behind at construction sites. Whether your space is completely new or only remodeled, consider the thorough cleaning that our expert cleaning crews provide. Generations of Americans have trusted Sears to provide them with quality goods and services. Sears Maid Services follows in that fine tradition by offering professional cleaning services backed by a commitment to professionalism and ethical conduct. Our hiring process ensures that the people you trust to come into your home take that responsibility seriously. All potential members of our team are thoroughly vetted, and they must pass a rigorous background check before being offered employment with Sears Maid Services. 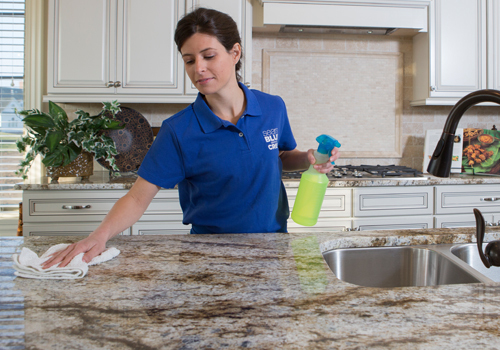 Our strict hiring policies ensure that your home will be cleaned by a crew you can trust. Once hired, our people receive training that covers the techniques and products necessary to deliver consistent results. New hires are paired with experienced team members to ensure that each crew measures up to your standards and ours. But we don't stop there. Our professionals receive ongoing education and training to ensure that they are well-versed in the advances and upgrades in the equipment and products that set our professional cleaning services above the others. Our hiring policies and training programs exceed industry standards to provide you with cleaning services that you can depend on. Our goal is 100 percent customer satisfaction. We are so sure of our crews that we guarantee their work. If you are not thoroughly pleased with our service, let us know within 24 hours and we will redo the job to your satisfaction. Sears Maid Services is proud to Help Women Fighting Cancer. Sears Maid Services is honored to work with Cleaning for a Reason. Cleaning for a Reason is a nonprofit organization that partners with cleaning businesses to give the gift of free house cleaning for women battling cancer throughout the United States and Canada. We are proud support such a great cause and help the women battling cancer in our community. We are a proud member of the McKinney Chamber of Commerce and are proud to serve our local community! We are on Thumbtack! Find our page here: https://www.thumbtack.com/-McKinney-TX/service/2078192. We are on Facebook. Click the link to like our page to stay up to date with our monthly cleaning special offers!